Courtesy of the City of Plant City. A map amendment and rezoning ordinance presented at last week’s public hearing brought up a long conversation at the dais on the quality of the roads near the property. Concerns regarding road improvements along the intersection of Wiggins and Rice Roads were the point of heavy discussion last week during the city commission meeting as commissioners considered approving a map amendment for a parcel of land at the location. The nearly 65-acre plot is pending a voluntary annexation and proposed to change from Hillsborough County Residential-1 to Plant City Industrial and to be brought into the I-4 Tech Corridor Overlay. If approved the site, which is currently an active agricultural production, will have a warehouse/distribution facility developed on the property. 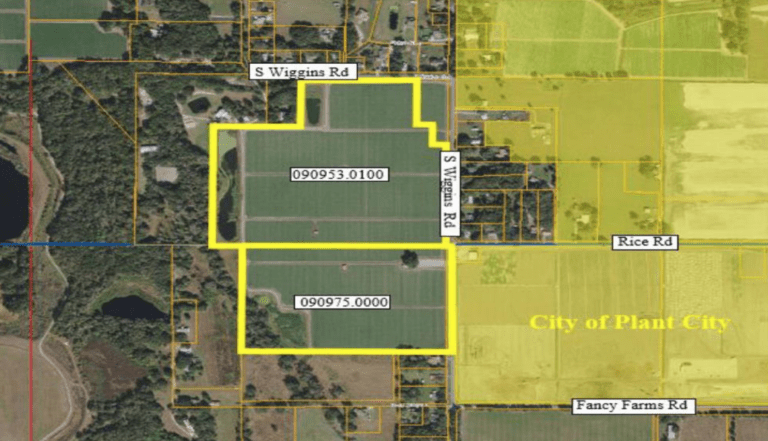 The same night commissioners also held a public hearing on the location to discuss rezoning the nearly 65 acres into the Wish Logistics Center Planned Development District. The discussion began after a neighbor to the property stepped up to the podium and voiced his concerns for the roadways if massive trucks began trekking back and forth to the proposed facility. The roads in question are about to undergo improvements anyway due to a separate agreement, but the neighbor was concerned even with the incoming changes there would still be a problem. Planning and Zoning presented the road analysis and didn’t find a need for any further improvements than those already scheduled to occur, however, several of the commissioners began to ask for more information. When the Planning Board voted to send the proposal to commissioners one of the six members voted no and asked for more information regarding Rice Road. The rest felt there was more than adequate data so the decision was passed along. Dodson agreed to wait until the next public hearing on April 8 to make a decision as the hope was more information would be available by then. All of the commissioners voiced their support of the project, however, their concerns for traffic caused nearly all of them to pause during the hearing. The road analysis in question found the soon-to-be incoming truck traffic would not impact nearby roads as all of the traffic would be in and out of Rice Road. The improvement slated to begin shortly would transform that into a three lane road with a designated turning lane, which would help with the massive trucks. Commissioner Mary Mathis said the analysis operated on the assumption trucks would not be going any direction but the path lined out in the analysis and asked for clarification on how that could be guaranteed. If commissioners continue to be concerned, Attorney Ken Buchman said the city has a section of its code that could be reviewed and used to clarify a designated truck route in the area. One of the roads in question is a county owned roadway so if the commissioners wish to continue this it will have to be passed to Hillsborough County. Representatives of the applicant agreed to discuss the arrangement with the city and may agree to later fund another traffic analysis in approximately 18 months if deemed necessary. The results of their conversations will be presented Monday night.